One of the largest obstacles facing private blockchain adoption is the expensive upfront cost of deploying a blockchain-based solution, but former JP Morgan employees have changed that with their holistic platform Kadena. This platform significantly reduces the cost of evaluating and deploying a blockchain-based solution by making its platform available for free on the AWS (Amazon Web Services). Major industries like Healthcare and Insurance are realizing the potential of blockchain and are converting to platforms like Kadena that ensure security and scalability by utilizing a blockchain-as-a-service (BaaS) model. AlleyWatch spoke with CEO and Cofounder Will Martino about the company’s origin, the state of the blockchain industry, and the company’s pipeline to make institutional blockchain adoption frictionless. Tell us about the product or service that Kadena offers. Kadena offers a holistic platform and tools for blockchain development, including a private, enterprise blockchain (released 2016), an upcoming public blockchain protocol (2019), and an open source smart contract language (launched 2017) that deploys to both public and private. Kadena tackles the issue of enterprise blockchain adoption with a frictionless private blockchain-as-a-service (BaaS) made available on AWS marketplace for free. Rather than all the complication with expensive licenses and on-premise installation, Kadena will enable everything in three clicks and at no cost. Kadena’s enterprise platform has been tested and proven to support up to 8K transactions per second and scale well beyond 250 nodes; compared to our competitors, we are considered the first “real” performant private blockchain. Our AWS version supports secure channels, trustless escrows, pluggable encryption, contract governance, and automatic bug detection via formal verification. This feature set is unmatched by other private blockchain products in the market. What market does Kadena target and how big is it? We capture not just the big enterprise institution but also the small business owner or entrepreneur who wants to expand their business through blockchain. The global enterprise (private) blockchain market cap is projected to be around $60B by 2024. The current market cap of bitcoin alone is roughly $60B. The blockchain-as-a-service model is intended to streamline the process of evaluating and deploying Kadena’s private blockchain. This enables organizations to start using Kadena’s enterprise blockchain service by quickly provisioning it online, which significantly reduces the cost and time to market that is associated with the on-premise installation of other blockchain solutions. Kadena’s free AWS edition is intended for evaluation and small-deployment purposes so it is limited to 2K transactions per second across 4 nodes. Clients seeking to leverage the full power of the technology, with transaction speeds of 8,000 tps and hundreds of nodes, will want to license the full version of Kadena’s enterprise blockchain software. What inspired the start of Kadena? 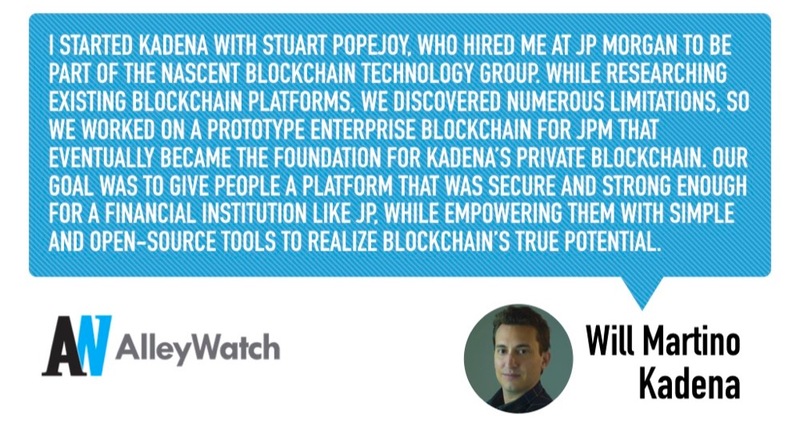 I started Kadena with Stuart Popejoy, who hired me at JP Morgan to be part of the nascent blockchain technology group. While researching existing blockchain platforms, we discovered numerous limitations, so we worked on a prototype enterprise blockchain for JPM that eventually became the foundation for Kadena’s private blockchain. Our goal was to give people a platform that was secure and strong enough for a financial institution like JP, while empowering them with simple and open-source tools to realize blockchain’s true potential. We raised around $15M last year for our public blockchain project, Chainweb, which goes into testnet and launch this year. What is one of the biggest problems for enterprises in adopting the blockchain? One of the many obstacles to private blockchain adoption is the expensive upfront cost of evaluating and deploying a blockchain-based solution in enterprises, both large (complex) and small (fewer resources). Kadena’s AWS solution seeks to address that problem by making deployment simple and easy. We are planning to launch the testnet of our public blockchain protocol, Chainweb, and expanding our private blockchain service to other platforms besides AWS Marketplace (like Microsoft’s Azure) within the next six months. We’re continuously working on updating our smart contract language, Pact (pact.kadena.io). 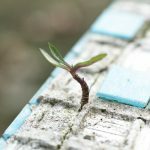 Value culture early and start building your team with your values (for instance, inclusion and compassion) from the get-go, not as an afterthought. We’d love to get in touch with educational organizations for communities often underrepresented in tech. We’re extremely committed to building our talented team from all walks of life. 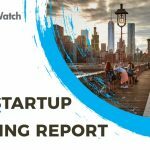 New York’s diversity, vibrancy, but also its legacy of experience in finance, business, and industry make it uniquely perfect for building technology that actually scales and gains adoption from larger institutions. Our company is Brooklyn-based and we take a lot of lunches at Frankie’s Sputino.